Once you have started creating your list, there are lots of options to move citations around and reorder them as you need. You can also edit the individual citations if you need to change any bibliographic information or add in notes for students on the module. Below are some hints and tips on what you can do. If you want to drag and drop single items around a list you can do this by using the 'drag citation' option at the right hand side of each item. Hover over the end and use the blue bar that appears. You may find it easier to move items if you zoom out slightly (CTRL + minus key) to view more items onscreen. An easier way to move items, particularly multiple items, is to use the new ‘My bag’ feature. For each item you want to move, click on the three dots to open the menu and then select ‘Bag it’. On the right hand side of the page you will see all of the items that you have selected. You can then click into the list where you want to move the items to. You can also move sections around in the same way which might help navigating the system if you are working on a device with a smaller screen. You can edit the bibliographic information for items added to your lists by clicking on the options (⋯) menu and selecting Edit item. Here you can amend the item type, for example specifying Book Chapter if there is a specific chapter required for reading. Accurate bibliographic information is valuable for both students and Library staff, especially if digitisation is requested or if copies of the item need to be purchased. Please note: the Library may amend bibliographic information for the purposes of accuracy and to match items with our catalogue records. If you are editing a particular section of your list and would like to hide it from public view whilst doing so you can. Click on on the options (⋯) menu beside the section in question and select Edit section. Here you can enter availability dates for the section, effectively 'hiding' it from student view until you are ready. To delete an item from your list, click on the options menu (⋯ ) and Delete item, then confirm. 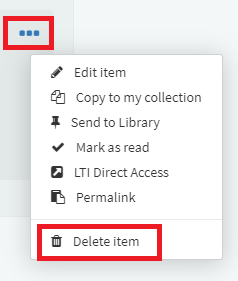 You can do the same with list sections, but note that all items within the section will also be deleted. There is now the option to reorder items in the different sections of your list by title or author. This is particularly helpful if you’ve been adding useful items as you go along creating your list. Note that it isn’t currently possible to reorder individual sections of a list. Click on the options button in the top toolbar and select which option you wish to use. Any reading list owner can lock a reading list to prevent it from being edited by other owners. A locked list cannot be edited by anyone, except for library staff or the list owner. All options for editing the list disappear from the action menus, and items cannot be rearranged. Unlock the list - only the person who locked the list (not the other owners), or library staff, can unlock the list. To lock the list, select Lock in the reading list menu and click OK. Remember that you need to add the priority tags on each item to help students manage their reading, and also to ensure that the Library purchases enough copies of the item. There is guidance on how to do this on the 'Add items' page.